Twitter introduces new Highlights feature to help you use it - Harold Tor. [UPDATED on 28 July 2015] Recently, Twitter pushed out a new feature (this is still being rolled out) called Highlights. When I first got it, I thought it was a great feature: it really helps you cut down the clutter, and if you follow tons of people, it really gives you an overview of the stuff you may have missed after the last time you used it. So how does Twitter’s new Highlights feature work? You first have to opt in to turn it on, of course. This can be done in the Notification settings. When you have the latest version of the Twitter app, it will appear as a small icon that looks like 2 cards beside the search icon. When you click on it, you will be presented with a series of floating cards (swipe left). So what do the Highlights cards feature? There are 7 kinds of Highlights cards that I have noticed so far. This is one of the retweeted tweets by someone you may or may not follow, tweeted by more than one of the people you are following. This is one of the highlighted tweets by someone you may or may not follow, favourited by more than one of the people you are following. This is a hashtag that is trending among the people you are following. [Updated on 28 July 2015] Well, I finally got a screenshot of this rare card, at least among my following, because I normally follow people who are not dormant. This highlights a user that many of the people you are following have just followed, so you should do the same. 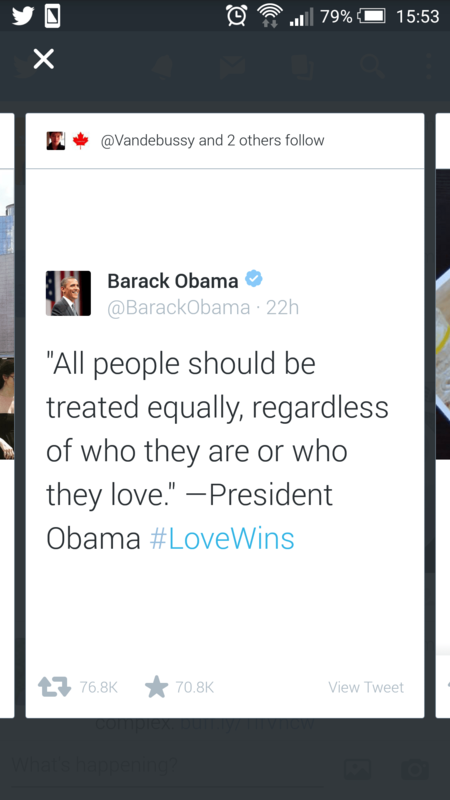 So how does the new Twitter Highlights feature affect your social media strategy? The tweets that have gained the most engagements in terms of retweets and favourites will be picked up by the user at a later stage. This means that popular tweets will gain even more coverage. If your aim is to share a link, then the more that link is shared in tweets the more likely it will be featured as a highlighted topic. When suddenly you are being followed by more people, there is a chance you will now be followed by even more people. If you are planning any outreach, get a good hashtag – punchy and short. When it trends, even among a community of users, it now gets pushed out as a highlighted hashtag to more dormand users of that group. Interested in my other ideas about social media strategies, fire a tweet over at @HaroldTor.